A man suspected in the 1996 slaying of 6-year-old beauty queen JonBenet Ramsey was arrested Wednesday in Bangkok - a breakthrough in a case some feared would never be solved. JonBenet was found beaten and strangled in the basement of the family's home in Boulder, Colo., on Dec. 26, 1996. Patsy Ramsey reported finding a ransom note demanding $118,000 for her daughter. At a Thursday morning news conference, a top Thai police official said John Mark Karr - a 41-year-old American teacher - has confessed to the Ramsey killing. Lt. Gen. Suwat Tumrongsiskul, who heads Thailand's immigration police, says Karr insists that his crime was not first-degree murder. "He said it was second-degree murder. He said it was unintentional. He said he was in love with the child. She was a pageant queen." The Thai officer quoted the suspect as saying he tried to kidnap JonBenet for ransom but his plan went awry and he killed her instead. Karr himself spoke to reporters after the news conference, saying he was with the little girl when she died - but didn't mean to kill her. CBS News correspondent Erin Moriarty, who covered the case for years and interviewed the Ramseys two years ago, says investigators were led to this suspect because of statements he allegedly made about the case. An FBI source tells CBS News the leads in this case originated in the United States and went to the FBI in Bangkok, where the suspect's e-mail and phone conversations have been monitored since earlier this summer. Investigators describe what the suspect talked about in his messages as "hair-raising - to see what he'd done, or contemplated doing, to children." The source calls those accounts "deadly frightening." Wednesday, in Boulder, District Attorney Mary Lacy said the arrest follows several months of work. A Ramsey family attorney says Karr, who teaches second grade, once lived in nearby Conyers, Ga., not far from one of the towns the Ramseys have called home. A law enforcement source, speaking on condition of anonymity, told the AP that Karr had been communicating periodically with somebody in Boulder who had been following the case and cooperating with law enforcement officials. A University of Colorado spokesman, Barrie Hartman, said journalism professor Michael Tracey communicated with Karr over several months and contacted police. The CU spokesman said he didn't know what prompted Tracey to become suspicious of Karr. Tracey produced a documentary in 2004 called "Who Killed JonBenet?" Ramsey family attorney Lin Wood says the arrest is vindication for JonBenet's parents, John and Patsy Ramsey, who had come under suspicion in the slaying. The attorney said the Ramseys learned about the suspect a least a month before Patsy Ramsey's death on June 24 after a long battle with ovarian cancer. "John and Patsy lived their lives knowing they were innocent, trying to raise a son despite the furor around them," said Wood. "The story of this family is a story of courage, and story of an American injustice and tragedy that ultimately people will have to look back on and hopefully learn from." "It's been a very long 10 years, and I'm just sorry Patsy isn't here for me to hug her," Wood added. Karr will be taken to Boulder, Colo., within the next week, where he has been charged with murder, kidnapping and child sexual assault, according to Ann Hurst, Department of Homeland Security attache at the American Embassy in Bangkok. Hurst also said Karr has been charged in the state of Colorado with murder, kidnapping and sexual assault of a child. Thai police say Karr's visa has now been revoked because, as a person accused of a crime in the U.S., he is an "undesirable person." 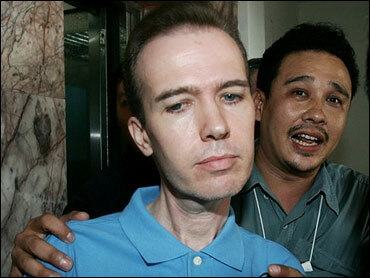 Authorities say Karr arrived at Bangkok's Don Muang International Airport on June 6 from Penang, Malaysia, and was looking for a teaching job during what was his fourth visit to the country in the space of two years. An FBI source tells CBS News that investigators knew the suspect was teaching at an international school somewhere in Thailand and that he had a lot of specific knowledge about the Jon Benet Ramsey crime scene. This evolved into a joint investigation: the FBI, the Royal Thai police, the U.S. Embassy, and the U.S. Immigration and Customs Enforcement agency of the Department of Homeland Security. According to the source, the content of the suspect's communications – that is, his e-mail and phone conversations concerning children - were very disturbing and led them to believe that children in Thailand were in imminent danger. Investigators, said the source, felt their suspect was a sick guy and whether or not he was JonBenet Ramsey's killer, they were "really worried that we would end up with another dead child, or at least somebody badly sexually abused." Nate Karr, brother of the suspect, says the arrest is a mistake, the accusations are "ridiculous, without a doubt," and the e-mail authorities found suspicious is related to a book his brother has been writing. Authorities haven't yet disclosed what evidence allegedly ties Karr to the crime. "A conviction isn't necessarily going to be a slam-dunk here," says CBS News legal analyst Andrew Cohen. "All of the problems that plagued investigators and police for all these years — the contamination of the crime scene and all that — doesn't just go away now... If you are a prosecutor or an investigator, you are looking for a confession that is going to stand up in court, or some sort of DNA or other physical link between the suspect and the crime scene: something that cannot be explained away by a good defense attorney, who is going to focus upon the contamination of the crime scene right after the murder." Images of JonBenet performing in a cowgirl costume and other beauty pageant outfits turned up on TV and in the papers soon after her body was discovered, and over the years, have sparked many theories about her killing. Investigators said at one point that JonBenet's parents were under an "umbrella of suspicion." They insisted that an intruder had killed their daughter, and warned other parents in Boulder to be aware that a killer was out there somewhere, unrestrained and unpunished. Patsy Ramsey also chastised the media and blasting local law enforcement as incompetent. In a statement Wednesday, John Ramsey said: "Patsy was aware that authorities were close to making an arrest in the case, and had she lived to see this day, would no doubt have been as pleased as I am with today's development, almost ten years after our daughter's murder." Waters, who described herself as a longtime friend of the Ramsey family, taped a piece of notebook paper to JonBenet Ramsey's headstone that read: "Dearest Patsy, Justice has come for you and Jon. Rest in peace." In 2003, a federal judge in Atlanta concluded that the evidence she reviewed suggested an intruder killed JonBenet. That opinion came with the judge's decision to dismiss a libel and slander lawsuit against the Ramseys by a freelance journalist, whom the Ramseys had named as a suspect in their daughter's murder. The Boulder district attorney at the time said she agreed with the judge's declaration. "I wasn't convinced it was an inside job, nor was I convinced it was an outside job," he said. "All the outside suspects were cleared after exhaustive investigation, and there were a whole lot of outside suspects." Patsy Ramsey made the 911 call on Dec. 26, 1996, telling police that her daughter was missing. "There's a note left and our daughter's gone," she said breathlessly. Boulder police responded immediately to Ramsey's call for help, and what first looked like a kidnapping quickly became a murder investigation, when JonBenet's body was found by her father in a small storage room in the basement of her house. Because of the bizarre ransom note, and the fact that JonBenet was killed in her own home, detectives focused on her parents, John and Patsy, as their prime suspects. Boulder police brushed aside many of the leads that came in, and dismissed the possibility that an intruder had somehow slipped inside the house and committed the murder. Throughout lengthy and sometimes hostile police interrogations, both in 1998 and 2000, the Ramseys maintained their innocence. A 2005 48 Hours report found that DNA evidence ruled out the parents as suspects and investigators were no longer focusing on the Ramsey family. The couple wrote a book, "The Death of Innocence," which was published in 2000.